Has Your Property Had a Famous Past? The BBC show which features celebrities researching their family trees, Who Do You Think You Are? has made researching your ancestry a popular pastime. But the same research that can dig up a lost relative could also help you to uncover your property's past. And why would you bother to do that? Well, finding a notable previous owner of your home could add around 10% to the value of your property. Around two million people looked into their property's past last year with many people beginning their search based on local urban myths. Even if your property's lineage is not star studded, you may find some interesting historical facts. Here are a number of ways suggested by Up My Street and ancestry.co.uk to find out more about your property's history. Keep in mind that not all of the methods for research given below will pan out, so if you hit a roadblock, don't give up - try something else. Chat to nieghbours, especially long time residents. Many libraries may also have a local history section with a dedicated librarian who may be able to help. The rumours that circulate about notable or celebrity residents who may have lived in your property can be your starting point. If possible, find out the name of the celebrity and approximately when they lived at the property. The title deeds of your property can help you trace previous owners and occupiers. If you do not have a copy yourself, ask your solicitor or mortgage company. These sources might also have older title deeds and documents relating to the property, including estate and family papers. Not everyone realises that anyone can buy a land registry online for £3 each. This record only began registering land in England and Wales gradually through the nineteenth and twentieth century so not all properties are registered. The Registers of Scotland looks after records for Scotland. You can search the Register of Sasines for land ownership records as far back as 1599, with records from 1875 available online. 4. What period was your home built in? The style of a property can tell you a lot about the period in which it was built. A well informed estate agent will often be able to give you an indication of when the property was built. Or click the link to use an online house dating tool to get an approximate date for when your house was built - just answer a series of questions to get an idea of the period your house may date to. Find out more about your area's history. Local book shops and libraries will likely stock books on your area's history. Many libraries will even have a local history section. You may even have a museum in your local area that may have records or a local historian. Your local records office will have old maps, newspaper cuttings and parish boundary records that you can search through. A great source for more information on parishes is available in Bartholomew's Gazetteer of Places in Great Britain. There are over 10,000 parishes in England and Wales, and many historical records and maps are calculated at this parish level. The UK National Archive, located in nearby Kew, is particularly useful, with its huge collection of historical records and information on the documentation available in other locations in the country. The National Archive has census documents from as far back as 1841 as well the electoral roll which you can use to track down former residents. Specialist websites such as Ancestry.co.uk provide access to similar data to the National Archive such as census data, local history records and even old phone book directories. The online access however, makes searches a bit quicker and you can do your historical digging in your jammies. Another way to find out when your house was built is to compare old maps at your local library, going back in time to find when your home first appeared on a map. The first Ordnance Survey map was published in 1801 for the County of Kent. There are over a million old maps in the Ordnance Survey archives. 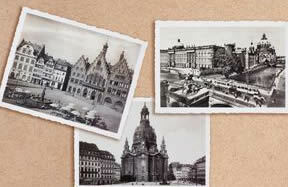 Try and find old photos which provide pictorial evidence of when your property may have been built. The website Old Aerial Photos has over a million old photos in its archive, and allows you to search by postcode to find your nearest local snaps, but this option is quite expensive, so be prepared to invest if you use this option. Look out for postboxes, churches, pubs and old shops for familiar landmarks. Even if your search does not turn up a major celebrity, you may find interesting records that might interest a potential buyer, creating a unique picture of your property's past. If you have a historically notable home that you would like to sell, contact Northfields Estates on 0208 840 6666 for your free valuation and we will tell you how we would market such a unique feature in your property.